The Lenox Tools 1787513 Bi-Metal Self Feed Bit 1-1/4-Inchis tougher than nails. The High Speed Steel Cutting Edge provides superior durability in nail embedded wood to stay sharper longer. The Chamfered Edge allows the bit to be removed easily after the drilling flutes remove the excess wood chips. The aggressive lead screw tip pulls the bit through the material quickly and effortlessly. This bit also features a longer shank that allows you to dril lthrough 4-by-4s without an extension. The shank features a 1/2-Inch Hex shank that will work with 1/2-Inch quick change adapters. This bit comes packaged with an extra lead screw and wrench to change the screw. 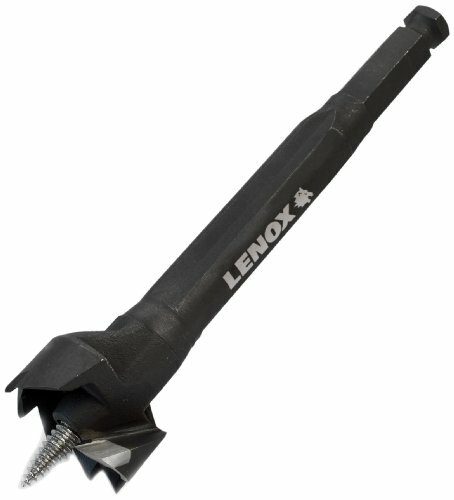 If you have any questions about this product by Lenox Tools, contact us by completing and submitting the form below. If you are looking for a specif part number, please include it with your message.